Home > FINANCIAL LITERACY > India Financial Savings in Shares, Insurance Rose..! India Financial Savings in Shares, Insurance Rose..! The central government’s decision to demonetise Rs. 500 and Rs. 1,000 notes on November 8, 2016 seems to have increased inflows into the financial sector, like insurance products and shares. 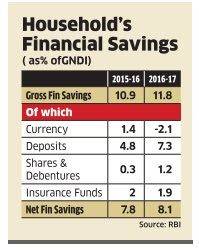 The Reserve Bank of India’s (RBI) Annual Report shows that the contribution of insurance funds in household financial savings reached a six-year high of 2.9% of the Gross National Disposable Income (GNDI) in 2016-17. Net financial saving was up from 7.8% to 8.1%.